The Third Edge of the Sword: Were Werner Patels and Badger from Firefly switched at birth? Were Werner Patels and Badger from Firefly switched at birth? On the left, Calgary blogger Werner Patels. 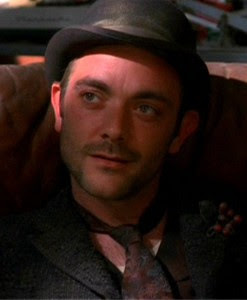 On the right, Mark Sheppard, the Brit actor who played "Badger" on the TV series Firefly. There is a storm front moving right across Canada, as well as other parts of the Western world, and unlike typhoons, which are said to be triggered by a butterfly flapping its wings somewhere in the world, this particular perfect storm seems to be the doing of just two men: Mark Steyn and Ezra Levant. In light of the news you post directly above this, that right-wingers in Canada using their real names can find themselves seated in front a quiet totalitarian woman who has the unilateral power to ruin their lives can it surprise you at all that so many of us choose anonymity? Now there's a larger point there that I don't want to get ignored, namely that in an environment where what was previously legitimate polemic arguments are now made summarily illegal, it does everybody in the society well for these comments to continue to be made, even if the "strength of the argument" is diminished by anonymity. On another level, is it perhaps a little dishonest to be so concerned about "anonymous pseudonyms"? If, for a totally random example, I announced tomorrow that I was Skyler Erasmus of 114th street in Edmonton, and posted as Skyler Erasmus on all blog posts, would it make Werner happier when I commented on his site? Would "Skyler Erasmus" be able to make more compelling arguments than "Feynman and Coulter's Love Child"? If so, we have a major problem: Skyler Erasmus is the name I just randomly picked out of the 2007/2008 Canada411.ca telephone directory. But its a "real person's name" and there's a good chance that I could milk it for a while. Then I might be Vladan Mitrovic of 108th street, and I'm no more or less anonymous than the fictional offspring of a conservative columnist and a theoretical physicist. An anonymous blogger is more like an anonymous pamphleteer than a phone pervert. The blogger doesn’t call you up. Instead, he or she publishes something that might or might not get attention. Some bloggers do in fact provoke others … that’s different than personally contacting them, but it is publicizing issues in a public forum. There’s a long, proud history of anonymous pamphleteering and anonymous publishing, including the Federalist Papers. Unfortunately, Steyn manages to find a strong argument against the anonymous blogger when he notes that pseudonyms have been used by the Human Rights dictators to possibly slander persons about to have their cases heard by the commissions. Muslims Against Sharia are proud to be the first Muslim group to publicly support Ezra Levant and denounce HRC inquisition. Proceedings against Ezra Levant are nothing short of ridiculous. HRC legitimizes radicals' claims that Islam cannot be criticized and Freedom of Speech only applies to radical Muslims. I just googled my name and this came up. How odd. I'm Skyler Erasmus, by the way. For all you irony fans out there, remember that this entire post's thesis was that according to Werner Patels it would be less "cowardly" for me to use a real name instead of a "fake handle" online, even though the real name isn't mine but rather one Skyler Erasmus. Now, the real Skyler Erasmus posts to this blog. What handle does he go by?